PostSecret was started by Frank Warren in 2004 when he sent off 3,000 self-addressed stamped postcards asking people to reveal a secret, anonymously, and mail it back to him. The postcard was to be decorated in a self-expressive or thematic manner. Warren received hundreds of responses which formed the basis of a community art project. And the secrets kept coming. Eventually, Warren started the PostSecret Sundays blog where, every Sunday, Warren uploads a selection of the secrets he has received that week. Further, PostSecret has become a publishing phenomenon with four best-selling books now out: PostSecret, My Secret, The Secret Lives of Men and Women, and A Lifetime of Secrets. Please consider sharing a follow-up story about how mailing in a secret, or reading someone else's, made a difference in your life. Beyond psychological healing, PostSecret has also caused me to think deeply about the failures of the church and modern Christianity. Specifically, the church claims to be a place, a community, that values confession, honesty, transparency, and authenticity. And yet, few experience churches in this way. Rather, churches tend to be places filled with hypocrisy, shallowness, pretend, and pretense. The younger generation increasingly sees the church as "fake." These same young people are flocking to PostSecret, a place and community they find to be more authentic, real, gritty and accepting. No doubt, many with find PostSecret odd, exhibitionistic, ill, and voyeuristic. I think these adjectives do apply. 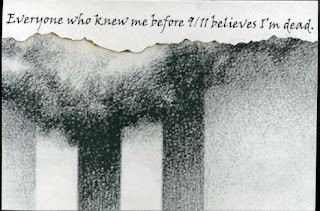 But at its core I think PostSecret has touched a nerve and is meeting a need. A need for authenticity and acceptance that the church has failed to address. Joe: Hi, Sam. How's it going? Sam: Great! How are you today? Joe: I'm good. How's mom and them? Sam: Their fine. Thanks for askin'. Beautiful weather we're having', isn't it? I wonder about the people who go to these so-called megachurches. On Easter I visited my aunt's megachurch in the DFW metroplex. I tell you, people didn't seem to know one another there. I went to the restroom--there was a long line because it was between services--and you would have thought you were at a professional ballgame: the men kept to themselves, they didn't banter or even acknowledge each other like you would expect in a close-knit church situation. You might say it had to do with restroom etiquette, but I disagree. There was no indication these people knew one another. I found the whole deal quite odd. I don't mean to dwell on the megachurch phenomenon, but I do think there is something there, especially in light of the proliferation of the mega-churches in the past decade or so. I wonder if some people like to remain anonymous at church. Maybe they feel like, if other people don't know you, they can't hurt you. Maybe that's the reason for the wall we put up. Absolutely fascinating. I had no idea anyone had done something like this. It certainly is all the adjectives chosen here. The only one I would add is: poignant. Rather, churches tend to be places filled with hypocrisy, shallowness, pretend, and pretense. The younger generation increasingly sees the church as "fake." I know of at least one church (cough, cough) that places a great emphasis on confession and spiritual guidance. Outstanding. Thank you for telling the truth. My secret: I almost never know what to say when someone asks me, "How are you?" It's probably the question in life I hate more than any other. I mean, really, people pay thousands of dollars for therapy to try to find this out. How the heck am I supposed to know? Ask my therapist! My name is Krystle Richman and I am an undergraduate student at Colorado College, located in Colorado Springs, CO. I am in the process of writing and conducting my own research for my senior thesis for my major in Sociology. Similar to you, I am extremely fascinated by PostSecret and the sociological aspect of the phenomenon and what it can reveal about the social context of our society - with the institutions of church, relationships, etc. With this, I wanted to examine the representation of these posted secrets in relation to "everyday life" secrets. Furthering that idea, I wanted to examine if Warren chooses the sensationalized secrets because they would essentially sell more books or give him more hits on his website. Essentially, we have very similar interests in the study of PostSecret and came up with very similar questions to pursue our research. My planned methodology was to contact Frank Warren and hopefully be given access to his collection of unpublished secrets (those never posted to the web blog or in his four anthologies); however, like you, he never returned my emails, etc. I also did my own data collection on campus by putting postcards in our student PO Boxes over this past month, but only received 50 secrets back which was not enough for a significant comparison sample. All of these dead-ends led me to now solely focus on the material and content that I have -- the PostSecret books, and simply do a content analysis of the social context of each secret. I am in the process of comparing the content from book to book with my coding process and to draw conclusions if Warren published more about fractured relationships, sexuality, mental health, etc. or those which could be deemed sensationalized. For the last four weeks, I have done nothing but read prior literature/research on secrecy (Simmel, Bellman, Hazelrigg, Vangelisti, Vrij, etc. ), commentaries on PostSecret (Boxer, Kloer, O'Sullivan, Turnquist, Karakayali, etc. ), sociological theoretical foundations (Durkheim, Weber, Veblen, Freud, Kant, Rousseau, etc. ), the confessional (Foucault and Rose), and social psychological theories (Freud, Mead, Cooley, Goffman, etc.) to write my literature review. Given that your study from last year is very similar to my own research, is there a possibility that I can have access to your paper/research presented at the symposium for the Southwestern Psychological Association convention? Your research is something I would like to discuss in my literature review.